Rosie’s Ranch is a new member of Volunteer Connect Douglas County and is actively posting volunteer opportunities. Rosie’s Ranch is a non-profit therapeutic riding facility in Parker, Colorado for children with and without special needs. Volunteers are the backbone of the organization and help make it possible to provide riding lessons, summer camp and birthday party opportunities for children. Their mission is to provide a family centered atmosphere where children with deafness or oral language challenges will expand their listening, verbal & reading skills by engaging in activities with horses under the guidance of a highly trained and qualified staff. Perhaps you’re a teacher off for the summer or you have a passion for horsemanship, horse anatomy, and working with children. Maybe you’re looking to complete your high school community service hours for graduation requirements. Match your passion with one of the many volunteer opportunities at Rosie’s Ranch and make a difference in your community. To learn more about Rosie’s Ranch and their volunteer opportunities click here. Volunteers are a key ingredient to the success of the Escape Room at DCL! The Castle Rock library will be hosting an Escape Room for the community called “Make Your Escape!” Gold lies at the altar of the Temple of the Serpent and Professor Triton went missing trying to find it. Participant teams will have timed entries to spend an hour trying to solve the mystery and if successful, claim their reward at the end. 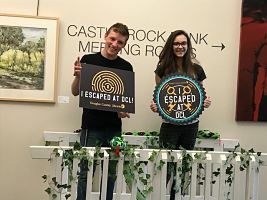 Volunteers help the staff creators of this event by creating custom jungle decorations on a grand scale and by doing a trial of the Escape Room as a participant, working with other volunteers and staff members to find clues and solve the puzzles. They then provide valuable feedback so staff members can refine the experience for the real event on March 24th. On event day volunteers will transform a meeting room into a jungle and serve as costumed guides while library patrons test their powers of logic, deduction and observation in the Escape Room. Volunteering with Douglas County Libraries provides myriad ways to get involved and have fun while supporting Douglas County Libraries’ mission to elevate the community by creating a love of reading, discovery and connection. Make your escape to the library and see what amazing discoveries await you! Click here to find volunteer opportunities at Douglas County Libraries. Be a Human Book Volunteer at the Human Library™ event in September! Douglas County Libraries (DCL) is hosting a Human Library™ event that allows members of an increasingly-diverse community to volunteer by sharing their stories in an open and respectful manner to build compassion and understanding. The Human Library™ is designed to build a positive framework for conversations that can challenge stereotypes and prejudices and to provide inspiration through dialogue and sharing. Learn more about volunteering at an information session on Sunday March 18, from 1-3:30 pm at the Philip S. Miller Library. Or email HumanLibraryDCL@dclibraries.org.